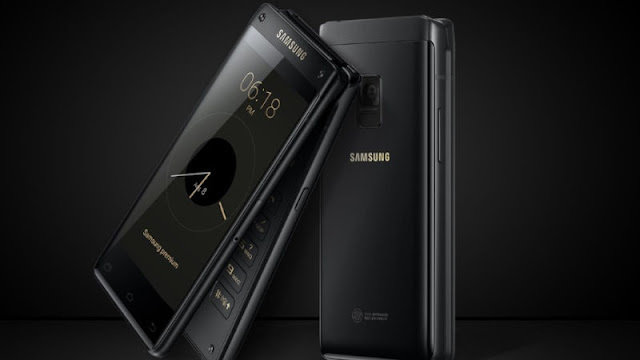 Samsung launched its W2017 flip phone in China last year and now the South Korean company has introduced its successor - Samsung SM-G9298 - for the same market. Notably, the Samsung G-9298, aka Leader 8 aka Leadership 8 (translated from Chinese), comes with a more powerful processor and improved optics over the W2017 and has been made available only in Black colour for purchase. The new dual-SIM (hybrid) Samsung SM-G9298 comes with two 4.2-inch full-HD (1080x1920 pixels) Super AMOLED displays - with one on the inside and one on the outside. The smartphone is powered by a quad-core Snapdragon 821 processor with two cores clocked at 2.15GHz and the other two clocked at 1.6GHz. The Samsung SM-G9298 packs 4GB of RAM. The connectivity options offered by the Samsung SM-G9298 include 4G connectivity, micro USB, USB 2.0, Bluetooth v4.1, NFC, Wi-Fi a/b/g/n/ac, and GPS. It houses a 2300mAh battery that is rated to provide standby time of 68 hours. The Samsung G-9298 measures 130.2x62.6x15.9mm and weighs 235 grams. Other features offered by the smartphone include Samsung Pay, S Voice, and Secure Folder.